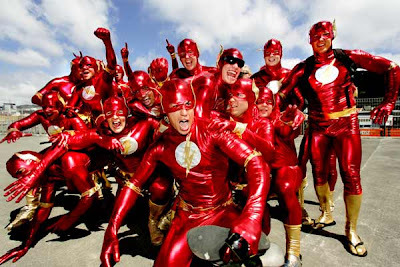 HOW MANY FLASHES DOES DC NEED? If you are looking for great vibes, awesome fun and a whole city getting turned into 'party central' for an entire weekend, then next week you'll be looking for Wellington, New Zealand. Every year when the Kiwi leg of the international IRB Rugby Sevens tournament lands, the city is flodded with people coming to enjoy the festivities, and even some who check out the sports. With 'Welly' the home of WETA Workshop there's no surprise there are major prizes up for grabs, for the best group of folk at the games with the most creative fancy dress. Last years entrant The Flash Gordon's from Hamilton won my vote on costume selection alone, even if they did get their Flashes muddled. Speaking of muddled though, The Costume Company owner Angela Brown reveals to stuff.co.nz that with her store having sold out of costumes in 7's Weekend 2009, the last three outfits to walk out the door were a fairy, Wonder Woman, and Dame Edna. Now that's a Brave and the Bold team-up I think we can all be glad was never captured on film.